Do I have to pay estimated taxes? 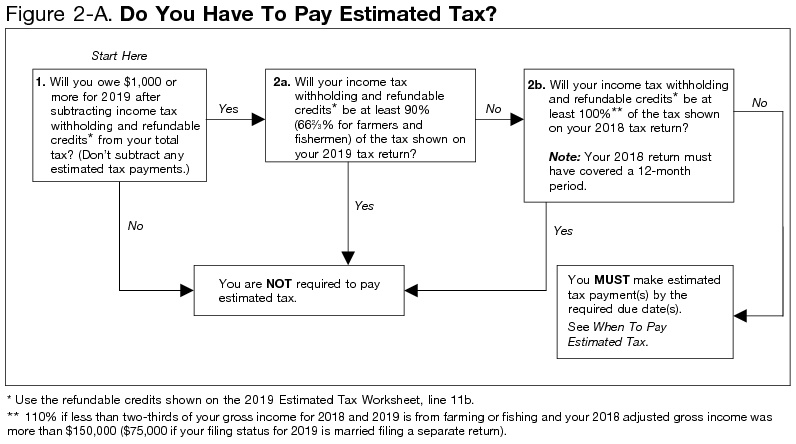 If you expect to owe more than $1,000 in 2019, you may incur underpayment penalties if you do not make these four estimated tax payments. Paying estimated taxes avoids an underpayment penalty, so to determine whether or not you need to pay estimated taxes, you need to look at what triggers the penalty. If you didn’t pay enough tax throughout the year, either through withholding or by making estimated tax payments, you may have to pay a penalty for underpayment of estimated tax. Generally, most taxpayers will avoid this penalty if they owe less than $1,000 in tax after subtracting their withholdings and credits, or if they paid at least 90% of the tax for the current year, or 100% of the tax shown on the return for the prior year, whichever is smaller. This spells out three criteria, and meeting any of these will avoid the penalty. First, if you do your 2019 tax return next year and find that you owe less than $1000 or you owe less than 10% of your total tax with your return, you will not owe a penalty. However, if you aren't sure what your total tax will be for 2019, you can ensure that you won't owe the underpayment penalty by making sure that your tax payments before your 2019 return equal at least what your total tax was for 2018 (or at least 110% of 2018's total tax, for high income earners). If you find that you might be subject to the underpayment penalty next year unless you pay more during the year, you can avoid sending in estimated taxes if you are employed by simply requesting that your employer withhold more tax from your paycheck by filling out a new W-4 form. Turbo tax triggered the 1040ES because they have no idea if 2018 was the new normal, or if it was never to be repeated. There are multiple ways to get to the safe harbors, so a taxpayer can avoid the underpayment penalty next April. Some get there by adjusting their W-4, others get there by having taxes withheld from non-employment income where that option exists, others make estimated payments. For my situation I have felt that in most years the 100% of the previous years tax was the easiest for me to make mathematically. I can know I am going to reach the threshold. The one time it resulted in a huge potential refund was the year after a large underpayment when I sold rental property. That next year if I used the 100% rule I would have had to grossly over-withhold in order to make the safe harbor. So I went with the 90% rule and hoped there was no December surprise. Not the answer you're looking for? Browse other questions tagged united-states estimated-taxes turbotax or ask your own question.